Founded in 1927, SANYO DENKI is a Japanese electronics manufacturer based in Tokyo, Japan. It is listed as a public company on the Tokyo Stock Exchange, 1st division. SANYO DENKI manufactures Servo Systems (Stepper motors, AC & DC servo systems), Cooling Systems (AC, DC, blower, centrifugal), UPS Power Systems (Uninterruptible Power Supply). It has 8 factories and 41 sales offices all over the world. SAN means mountain in Japanese, and UPS stands for Uninterruptible Power Supply. We have seen many challenges in our Uninterruptible Power Supply business over the last 90 years, but we have successfully overcome them. We like to think overcoming those difficulties are similar to summiting a mountain. Therefore, SAN-UPS will help support your business to overcome any monumental challenge and achieve your dreams. How do SANUPS products stand out? SANUPS is designed by our Japan-based research and development center. We have been tailoring our mission-critical products to our customer’s applications for over 90 years. We are also investing in innovating new products, obtaining patents for our technology, and improving product quality through customer feedback. Online UPS (Uninterruptible Power Supply), also known as a double conversion UPS, is the most reliable topology in the UPS market. Since SANUPS is designed for mission-critical equipment, and the industry’s high-quality demand, most of our products employ a double conversion topology. However, we also make offline Uninterruptible Power Supplies to cater customer’s requests and needs. Where are SANUPS products made? SANUPS products are made in either Japan or the Philippines. All of the factories are ISO 9001, and ISO 14001 certified. In addition, our Philippines factory is OHSAS 18001 certified. Our UPS (Uninterruptible Power Supply) capacity is in the 1kVA to 20kVA range for the U.S. market (single-phase). Each model has unique features and different specifications. For more detail, please visit each specific model’s page on this website. We have been faithfully serving our clients for 90 years. We know each industry has its individual challenges. We’ve enhanced our skill set and gained expertise through thousands of projects. Semiconductor, Medical, Traffic, IT, and Telecom are a few examples that we are experienced in. Can you customize the UPS for my needs? Our credo is to become partners, solve problems, and build mutual trust. SANYO DENKI offers customized and private labeled solutions for its partners. SANUPS uninterruptible power supply systems are designed and manufactured entirely by SANYO DENKI. It has been recognized and favored by the world’s most demanding applications. Please contact us for Strategic Alliances and OEM Agreements. Can you obtain certification for me? Sanyo Denki can obtain NEMA (National Electrical Manufacturers Association) Standards, MIL-Standards (Military Standard), BSMI (Bureau of Standards, Metrology, and Inspection), CE/IEC (Conformité Européenne/ International Electrotechnical Commission), cUL (Canadian plus Underwriters Laboratories), and UL (Underwriters Laboratories) safety standards. The process involves a variety of production and quality tests to ensure your satisfaction. All of the Uninterruptible Power Supplies on our website are UL 1778 listed. Working in accordance with your application, and if the annual demand and project schedule match, we can obtain UL1446, UL60601, UL508, UL544, and UL924. What is SANYO DENKI’s Eco-Products logo? SANYO DENKI’s Eco-Products logo is accredited to those products that satisfied the company criteria and assessed on the environmental impacts applicable to all processes, ranging from design to manufacture. SANYO DENKI’s Eco-Products are designed from product development, packaging materials, to disposal with the concept of lessening the impact on the environment. To show the part number nomenclature, please click the image below. What is the average product life and MTBF? We know that the reliability is the first thing comes to our customer’s mind. A UPS is such an essential piece of equipment to protect customer’s operation and business. The average hardware product life, depending on the model, is 7.5 years to 10 years. In the same way, MTBF varies in each model. For more detailed information, please contact our sales representatives. Sanyo Denki America, Inc. (SDA) warrants the Product to be free from material defects in materials and workmanship for a period of thirty-six (36) months for Uninterruptible Power Supply (UPS), twelve (12) months for D11A inverters, and (1) year for internal battery packs from the date of purchase. Upon reasonable inspection and judgment, Sanyo Denki America, Inc. (SDA) will either repair or replace any defective parts of the product upon return to SDA. Parts replaced during the warranty period do not extend the life of the basic product warranty. This warranty applies only to the products specified by this warranty policy. Sanyo Denki America, Inc. disclaims all responsibility for damage to any load device, software, and loss of data. How do I check if my product warranty is still valid? SANYO DENKI AMERICA, INC. provides three different ways to support you. Our knowledge-base page https://ups.sanyodenki.us/support/home has online manuals, instructions, and helpful information for most of our Uninterruptible Power Supply systems (UPS). SANUPS 24 hour Call Acceptance Center is your first point of contact. Our operators are standing by in case of an urgent matter. They will open a support ticket and escalate the situation to the upper tier for you. The phone number is (310)783-5405. Also, you may open a support ticket by sending us an e-mail at sanups@sanyo-denki.com. Our support system will automatically open a new support case and it will send you the case number for your convenience. What is the battery pack part number? Battery pack part number starts with “BP” and your UPS model number follows (e.g., BPA11J). You can find which battery pack, and how many you need, at the URL links below. How long does the battery pack last？How does the UPS know the battery condition? Most of the lead-acid batteries in our UPS system will last 5 years, Nickel-Hydride batteries and Lithium-Ion batteries will last 10 years when the surrounding temperature is 25°C/77°F according to the respective battery manufacturers. An automatic battery health check (Default is set to every 6 months) will inspect the battery discharging voltage and will beep to notify you if it detects lower voltage than the normal. Our UPS is also programmed to notify you with a beep when the battery needs to be replaced based on the period of the time calculated and by the surrounding temperature. The default is 4.5 years with 25°C/77°F since the initial installation. The higher the temperature, the sooner you would hear beeping and vice versa. The beep will be triggered by whichever comes first. (For this reason, you will need to reset the battery information when you change the internal battery pack. You can find the battery reset instruction in the product manual). SANUPS products all have hot-swappable batteries. The cable connector and battery pack housings are designed with easy and simple maintenance in mind. Please note that the UPS systems are UL listed and CE marking products. To keep these labels, please ask our field support to replace the battery. When you change the battery, please be sure to wear insulated gloves and shoes. It is also a good idea to remove rings, necklaces, and watches. Using insulated tools is also the best practice. Please do not use a third party battery or mix up old and new batteries. Using the same battery longer than its product life may decrease the backup run time and the worst case, catch fire. My city regulates battery capacity by law. How do I know the capacity? Total Battery Capacity (Ah・Cell) can be calculated by the formula below. What is the difference in between a Lithium-Ion battery and a Lead-Acid battery? The lithium-ion battery has dramatically more battery-charging cycles compared to a lead-acid battery which makes the product life so much longer. Besides, Lithium-Ion batteries are small and lightweight and fit in many small electronics such as a mobile phone or laptop computer. The power of electricity that a Lithium-Ion battery produces is powerful which means it requires a charging voltage control at the highest level. Also, Lithium-Ion batteries cost more than lead-Acid batteries because of the material it uses. SANUPS A11K-Li finished its development and is expected to be released in early 2019. Lithium-Ion Batteries tend to have a complex charging circuit because it is susceptible to charging-discharging. If the voltage control is not thoroughly managed, it may result in a significant accident and this has been a big challenge to many electronics manufacturers. Our SANUPS A11K-Li was not an exception. To overcome such a challenge, A11K-Li monitors temperature, charging ratio, and voltage information by CAN communication. With this communication, the UPS circuit and Lithium-Ion battery will be completely separated in case of over-charge, over-discharge, and short-circuit. This technology makes A11K-Li UPS safe and user-friendly. If you were to store the Lithium-ion battery UPS, please remember the points below. 1: Lithium-ion batteries get more impact from the environment than a lead-acid battery. 2: If the Lithium-ion battery is fully charged, it becomes progressively worse faster. In other words, Lithium-ion battery deteriorates slower when it is less charged. 3: If a Lithium-ion battery is completely discharged, it will not be able to fully recharge. 4: A lower storing temperature is better for Lithium-ion batteries. 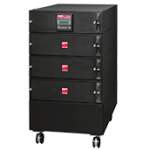 Uninterruptible power supply (UPS) is a power supply system that contains a rechargeable battery to provide power to the load equipment in the event of a power outage. Several reasons cause the power fluctuations including power outage, voltage dip, voltage spike, brownout, noise, and frequency fluctuation. The Power Basic Knowledge page explains those causes in depth. What is the difference in between a stand-by UPS, online UPS, and line-interactive UPS? There are three different topologies for Uninterruptible Power Systems; Online, line-interactive, and standby. 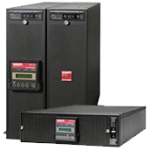 Online UPS is also known as a double conversion that accepts AC input and rectifies to DC and then inverts back to 120 V/208 VAC to feed the electricity for load equipment. Since Online-UPS converts the power twice on the circuit, it is called “Double Conversion” and outputs a pure-sine wave which is favorable for the load. On the main circuit board, there is a dual-directional circuit for the rechargeable battery. This rechargeable battery will back up the load equipment during a blackout. There is no power down when the power source transfers from a double-conversion circuit to the rechargeable battery. 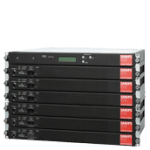 Online UPS is the most reliable UPS, and it is the reason why many manufacturers have employed SANUPS for highly critical loads in various industries. Line-interactive UPS is similar to offline UPS in its circuits but enhanced by the adding a transformer (voltage regulator) to condition the utility power. It slightly improves efficiency and reduces battery usage. Though Line-interactive UPS is not as reliable as Online-UPS, it is still prevalent among the consumer and IT professional markets. A Standby UPS powers the load directly by commercial power. There is no modification added to the output by the UPS. A Standby UPS only invokes when the utility power fails. In other words, Standby UPS would not protect the load from unfavorable power conditions. This type of UPS does not require as many parts as an Online-UPS, and it is often seen in consumer markets because the capacity demand is small (less than one kVA) and the price is inexpensive. Is there any load device I should not connect to UPS? Devices such as laser printers, fax machines, copiers, vacuum cleaners, hair dryers, and projectors will damage or cause a UPS to malfunction because they tend to create instantaneous overcurrent. Does my load device get damage when a blackout happens? Our Uninterruptible Power Supply (SANUPS) is an Online-UPS. It converts AC input to DC and then inverts back to AC to output a pure sine wave that protects your load devices. Even if a blackout happens, your load device will not get damaged. On the other hand, Line-interactive UPS and Offline UPS do not have a full capability to create a pure sine wave which means power fluctuations such as a blackout may damage your load device. What’s my backup time and load %? You can find a backup runtime graph on our website. The higher the load %, the shorter the backup runtime. Please remember the backup time varies depending on the temperature, load device’s power factor, and age of the battery. Is there a bypass circuit in SANUPS systems? Yes, there is a bypass circuit in our UPS system for even greater reliability. UPS changes the mode from an online mode to a bypass mode when overcurrent happens. The change is instantaneous, and there will be no power down. The system will check if the load has no problem, and then changes the mode back to online mode. This mechanism works in the same way when overload happens. If the UPS is damaged by overcurrent or overload, the output will be stopped. How do I select input cable size? Hardwire connection type UPS systems require compatible cables. To find out the cable size, please check the user manual. EPO stands for Emergency Power Off. 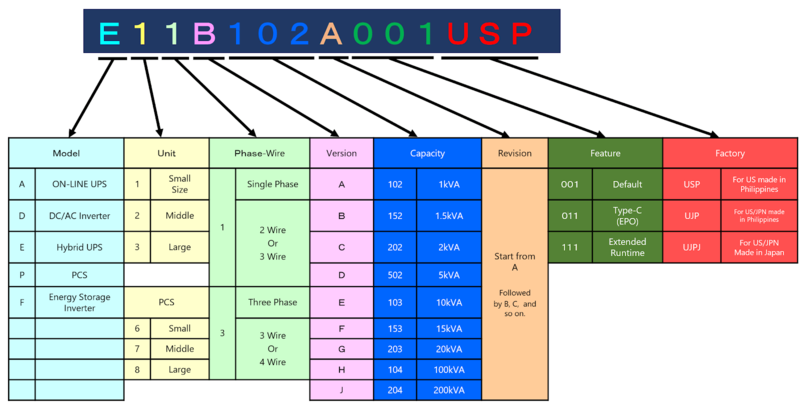 UPS that include part number 011 are called Type-C, and they have an EPO interface. You can utilize this interface to control (e.g., send a shutdown signal) and communicate (e.g., send a serial signal) with the UPS from the remote device. What is the difference between Three-Phase and Single-Phase? Single-Phase power refers to a two-wire Alternating Current (AC) power circuit. Typically there is one power wire and one neutral wire. Those two wires produce AC power similarly to riding a bicycle, two legs are a single-phase system delivering power to your bike. With this system, the power is delivered unevenly, with maximum power when the legs are horizontal and no power when legs are at top and bottom. Three-Phase power refers to three wire Alternating Current (AC) power circuits. Typically, there are three (Phase A, Phase B, Phase C) power wires (120 degrees apart in each phase) and one neutral wire. Three-Phase systems produce power similarly to riding a bicycle, but with an imaginable third leg and third pedal. It can deliver power continuously to the bike instead of delivering power unevenly as Single-Phase does. The major advantage to a Three-Phase system is that it delivers large power more efficiently, reliably, and smoothly. In the United States, SANYO DENKI is providing mainly Single-Phase UPS (Uninterruptible Power Supply) systems. Please contact Sales for Three-Phase UPS systems. 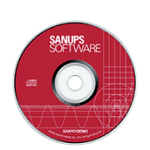 Yes, SANUPS Standalone Software is free. It is a free edition with limited features and only for use with Windows OS. The standalone version does not support a network connection. To unlock the full functionality, please purchase SANUPS Software (Windows ver. & Multi-OS Ver. available). How do you shutdown PC? With customer’s feedback, we developed two shutdown products. Please select either SANUPS SOFTWARE or LAN Card to shut down a connected load. When you purchase a UPS, it comes with SANUPS STANDALONE SOFTWARE. By installing this software on an administrator’s PC and connect it to the UPS via a serial cable, you can shut down your computer when the input power experiences a problem. Can I shut down Windows Devices using SSH? Our LAN Card can shut down the target device by logging in with SSH. Unlike a standard FTP connection, SSH communication encrypts all the information including passwords and ensures your security. SSH connections use a host key and a user key to establish a secure authenticated connection. For Windows OS, though functions may be limited, you can shut down devices with password authentication only when a commercial SSH is installed in the target computer. To configure this, please see the user guide. The user guide has multiple device shut-down information as well as SSH algorithm compatibility. Can I use the newest LAN CARD and SANUPS SOFTWARE Ver.1.1.4 or an older version? LAN Card and SANUPS SOFTWARE STANDALONE cannot be used together. If you are using the newest LAN Card and SANUPS SOFTWARE, the software has to be later than Ver.2.0.0. If you have purchased a different version of software over the years, please change the LAN Card operation mode set to compatibility mode. Yes, both LAN Card and SANUPS SOFTWARE can shut down virtual servers as well as data storage devices such as NetApp if they are capable of logging-in using SSH/Telnet. In this situation, the target OS does not need SANUPS SOFTWARE installed. For more detail, please see the product page here. How do I reset LAN Card settings? For the new LAN Card (Part Number: LANIF011B-US and LANIF013-US), you can reset it by pressing the button that is on the front side of the LAN Card for a few seconds. The reset procedure will not impact the UPS. How do I initialize the LAN CARD? What kind of cable do I need to connect to LAN CARD? Our LAN Card comes with a serial cable that you can connect your PC and the UPS. If you were to use a third party cable, please make sure to use the appropriate cable. For detailed information, please see here. 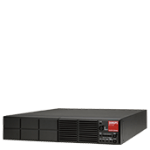 Our UPS contains internal memory to record input power status, blackout duration, power restore time, load status, and UPS trouble, etc. You can check that information from the LAN Card. The event log will display as detailed code. Please locate a code with the code list in the user manual. Simple Network Management Protocol (SNMP) is an application-layer protocol used to manage and monitor network devices and their functions. Also, our LAN Card supports an SNMP agent. An SNMP agent is a network-management software module that resides on a managed device. Our LAN Card supports agents using standard MIB RFC1628 & JemaMIB, and Expanded MIB is a private MIB. By using those agents, you can stop the UPS, display status, and monitor the UPS. There is no need to change the setting because our SNMP management system can communicate with all agents mentioned above. It is easy and user-friendly. A management information base (MIB) is a database that manages the entities in a communication network and associated with the Simple Network Management Protocol (SNMP). Our LAN Card supports SNMP agent function. To download standard MIB data, please visit our website at https://sanups.sanyodenki.us/product/lan-card/ and click the “Software & Firmware” tab. My web browser does not show the LAN Card Interface. Why? If your web browser is not displaying the LAN Card interface, please make sure you are using Internet Explorer 8 or later. Google Chrome, Firefox, and Microsoft Edge are also supported, but only when the Java Web Start function is used. How do I turn off the popup message from SANUPS SOFTWARE STAND ALONE? UL is a voluntary standard that is certified by the nonprofit testing organization of Underwriters Laboratories Inc. founded in 1894. However, it became the de-facto standard in the United States, and this organization conducts the certification test of an electric appliance. UL 1778 applies to Uninterruptible Power System (UPS). The primary function of the UPS for this Standard is to ensure continuity of an alternating power source. The Uninterruptible Power System also serve to improve the quality of the power source by keeping it within specified characteristics. This Standard applies to movable, stationary, fixed, and built-in UPS for distribution systems up to 600 V a.c. This Standard is intended to reduce the risk of fire, electric shock, or injury to persons from installed equipment, both as a single unit or as a system of interconnected units, subject to installing, operating, and maintaining the equipment in the manner prescribed by the manufacturer. Our SANUPS Uninterruptible Power Supply systems for North America market are all UL1778 certified. IEC 62040-1 applies to movable, stationary, fixed or built-in UPS for use in low-voltage distribution systems and that are intended to be installed in an area accessible by an ordinary person or in a restricted access area as applicable, that deliver fixed frequency AC output voltage with port voltages not exceeding 1000 VAC or 1500 VDC and that include an energy storage device. It applies to pluggable and to permanently connected UPS, whether consisting of a system of interconnected units or of an independent group, subject to installing, operating and maintaining the UPS in the manner prescribed by the manufacturer. IEC 62040-2 is a type test product standard for electromagnetic compatibility (EMC) and applies to movable, stationary, fixed or built-in, pluggable and permanently connected UPS for use in low-voltage distribution systems with an environment being either residential, commercial, light industrial or industrial, which deliver output voltage with port voltages not exceeding 1500 VDC or 1000 VAC and which include an energy storage device. CE marking is a conformity certification with health, safety, and environmental protection standards for products sold within the European Economic Area (EEA). The CE marking is recognized worldwide and is the manufacturer’s declaration that the product meets the requirements of the applicable EC directives. Electromagnetic compatibility (EMC) is the concept of enabling different electronics devices to operate without mutual interference – Electromagnetic Interference, EMI – when they are running close to each other. EMC is now an integral part of any electronics design project. With standards now implemented and enforced across the world, Sanyo Denki’s UPS products have been tested to ensure it meets the relevant EMC standards. While this presents an additional challenge to the electronics design engineer, it is essential that good EMC practices are employed and the EMC performance of the product is sufficient to ensure it operates correctly under all reasonable scenarios. The Federal Communications Commission (FCC) regulates interstate and international communications by radio, television, wire, satellite, and cable in all 50 states, the District of Columbia and U.S. territories. An independent U.S. government agency overseen by Congress, the commission is the United States’ primary authority for communications law, regulation, and technological innovation. Nearly every electronics device sold inside the United States radiates unintentional emissions and must be reviewed to comply with the Code of Federal Regulations (CFR) Part 15 before it can be advertised or sold in the US market. CFR Part 15’s Subpart B deals with unintentional radiators such as computers that were not intended to produce radio waves. All Sanyo Denki’ SANUPS UPS systems comply with CFR15 Part 15 Sub-B Class-A. Voluntary Control Council for Interference by Information Technology Equipment – VCCI – is a membership organization with the purpose to suppress electromagnetic interference from ITE in Japan. VCCI started as a voluntary organization in 1985. VCCI was reconstituted as a legal entity “VCCI Council” in April 2009. The number of VCCI members is approximately 1,200 which is half Japanese companies and a half overseas companies. VCCI and FCC agreed to mutually accept test reports issued by accredited laboratories of the other country in February 2007 in the framework of Japan-US telecommunication MRA. RoHS stands for Restriction of Hazardous Substances and impacts the entire electronics industry and many electrical products as well. The original RoHS, also known as Directive 2002/95/EC, originated in the European Union in 2002 and restricted the use of six hazardous materials found in electrical and electronic products. All applicable products in the EU market since July 1, 2006, must pass RoHS compliance. Directive 2011/65/EU was published in 2011 by the EU, which is known as RoHS-Recast or RoHS 2. RoHS 2 includes a CE-marking directive, with RoHS compliance now being required for CE marking of products. 468 Amapola Avenue Torrance, CA 90501, U.S.A.
© SANYO DENKI AMERICA, INC. All Rights Reserved.